Janie Ebinger is not new to the cooking profession where she creates and writes new and exciting recipes. She has a very unique and exciting way of writing her recipes so that they are simple and easy to use and has certainly accomplished this task in her new book “Simply Vinaigrettes: from Ancho Chili to White Wine”. There are 55 recipes in this book for all to enjoy. There is sure to be plenty for you to amaze your family and friends with. 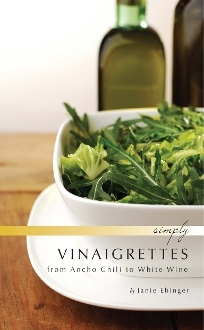 Janie not only gives you the recipes, but she also gives exciting ideas about how to serve the vinaigrettes.